Just one week after going on sale to the public, staterooms for ShipRocked are sold out! Setting sail January 16-20, 2017 onboard Carnival Victory, the eighth edition of ShipRocked will feature headliner Breaking Benjamin, along with Papa Roach, Alter Bridge, Sevendust, Pop Evil, The Stowaways all-star band and more sailing from Miami, FL to Grand Turk in the Turks & Caicos Islands. "We are consistently blown away by the love, support and enthusiasm shown by our community of guests for ShipRocked," says ShipRocked producer Alan Koenig of ASK4 Entertainment. "We can't wait to show them our appreciation by delivering a one-of-a-kind experience in January." ShipRocked 2017 has already received national media coverage. Mary Forgione of the Los Angeles Times said "ShipRocked 2017 is perfect for rock 'n' roll junkies" [May 6, 2016], while Chad Childers of Loudwire.com called ShipRocked "…one of the premier events for rock and metal fans…" [May 2, 2016]. ShipRocked also recently received coverage from USAToday.com [May 11, 2016]. Ladies and Gentlemen! Boys and Girls of all ages! It's time to roll up for our annual rock & roll revue! 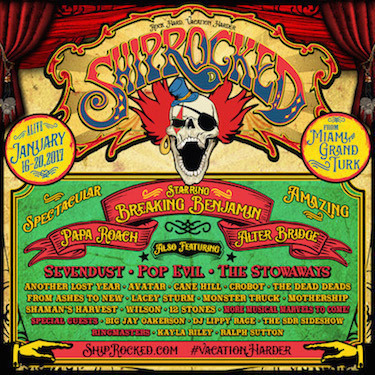 That's right, it's The Greatest Vacation On Earth, under the ShipRocked Big Top!